Pontianak Art legend the role of Rano Karno and Cornelia Agatha was surrounded by his fans while meeting and greet at the Mercure Hotel Pontianak, yesterday (14/8). The arrival of these two senior artists in order to promote the film Si Doel Anak Sekolah in all theaters throughout Indonesia. The most popular soap opera title in almost four decades. "This is to treat the longing for mothers and grandmothers in Pontianak," joked Si Doel. How not, since the launch of this soap opera in 1992, always sold. Even the old version, still repeated on television. "This is because Doel reflects the lives of most people in Indonesia. Besides that, the entertainment is also interesting, and the storyline with Doel's love with Sarah and Zainab makes it interesting, "he said. The characters of Si Doel's own actors are very attached to the characters they know. So monumental, Rano Karno, even though he was still the Governor of Banten, was often greeted by Si Doel. "For example when I visited West Kalimantan several years ago. Riding a car Mr. Cornelis (Former Governor of West Kalimantan) I was shouted at by people on the street. Hey there is Si Doel, there is Si Doel, "he said. His party targets as many as 3 million viewers. Bhkan after the beginning of August the film was screened after the target was reached. 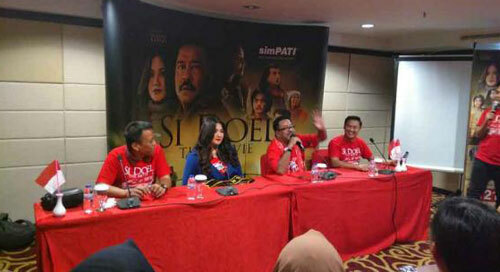 "We are proud, because for the Si Doel film, the demand is quite a lot. Even from Aceh to Papua is the same. Likewise in Timor Leste who are still happy with us. This means that even though the film is simple but attached to the hearts of viewers, "he said. Conelia Agatha aka Sarah, appreciated the fans of the Doel movie in Pontianak, and even the Pontianak Do Doel Lovers Community was formed. These mothers even brought souvenirs for the film players. "We thank you for the attention of the fans who are still faithfully watching the film that we play. We invite people to watch Si doel the Movie in the cinema here, "he concluded.